1 Can you imagine what it would be like to leave everything you have ever known? You might have to sell or give away most of your belongings. You can't take much with you, and you'll need every dollar you can get. Then you might travel hundreds of miles just to get a ship to take you to this new country. That is what many immigrants faced when they chose to come to Canada. 2 Once they were on the ship, they often had to endure cramped sleeping quarters with many other people. There was no quiet or privacy for the whole journey. Finally, they arrived in Quebec where they moved through the immigration buildings. 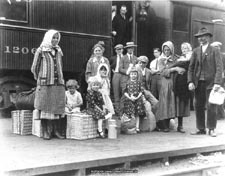 3 It would be a relief to finally board the Canadian Pacific Railroad and begin the last major leg of their journey West. From the windows of the passenger cars, they could see the changing landscapes of this vast new country called Canada. 4 Some people came singly; others came with families. Still others came in groups hundreds or thousands strong like the Mennonites, Doukhobors, and Jews. Mormons moved north from Utah and Icelanders came from Iceland.